The 2015 Chelsea Plant of the Year has been announced. The accolade has gone to Viburnum plicatum f. tomentosum Kilimanjaro Sunrise. RHS plant committee members selected the 20 plants that were considered for the title of 2015 Chelsea Plant of the Year. 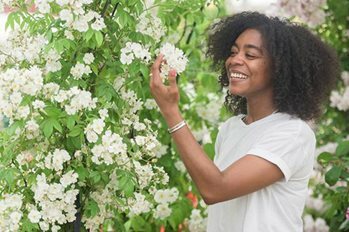 The range of plants covers edibles, seasonal bedding and shrubs and all are being exhibited to the public for the first time. All 20 finalists are on show in the Great Pavillion. Viburnum plicatum f. tomentosum Kilimanjaro Sunrise (‘Jww5’). Shrub with an appleblossom pink flush, and young flowers becoming pure white with age. Relatively compact and slow growing. Exhibited by Burncoose Nurseries. Streptocarpus ‘Polka-Dot Purple’. Houseplant with striking white and purple flowers produced for up to 10 months of the year. Exhibited by Dibleys Nurseries. Salvia ‘Love and Wishes’. Graceful, arching plant producing rich purple flowers with burgundy calyces from May to October. Exhibited by Dysons Nurseries. Anigozanthos 'Pink Pearl'. A pale pink flowering kangaroo paw bred in Australia for garden and container use. Exhibited by the National Dahlia Collection. Antirrhinum Pretty in Pink ('Pmoore07'). A perennial form with good rust resistance, re-blooming continually throughout the summer. Exhibited by Hardy's Cotttage Garden Plants. Blechnum brasiliense Eruption ('Alceru'). Bred in the UK, this new fern has bright red fronds when young, and adds drama to the garden when planted alone or in a group. Exhibited by Bowden Hostas. Camassia leichtlinii subsp.suksdorfii (Caerulea Group) 'Maybelle'. A relativley compact cultivar flowering from late April to early May suitable for heavier soils in sun or part shade. Exhibited by Avon Bulbs. Dianthus (Allwoodii Group) Tequila Sunrise. ‘Wp15 Pie45’ (Cocktails Series). Hardy, drought-tolerant and ideal for the novice gardener, this new cultivar has apricot flowers up to 5cm across. Exhibited by Whetman Pinks. Fuchsia ‘Pink Fizz'. A climbing form reaching 5-6ft covered in sugar-pink pendulous blooms. Exhibited by Scotts Miracle Gro. Gerbera Garvinea Sweet Surprise (‘Garsurprise’) (Garvinea Sweet Series). Perfect for containers, this new form has orchid pink flowers from spring until the first frost. Exhibited by Birmingham City Council. Gladiolus ‘Prima Verde’. Cut flower with striking olive green flowers with a deep red throat. Exhibited by Pheasant Acre Plants. Iris ‘Poivre Rouge’. Bright yellow blooms are decorated with red-brown striations and red speckles at the bottom of the falls. Exhibited by Cayeux Iris. Lilium ‘Twyford’. A pink, pollen–free double Oriental with a lovely scent and suited to growing in a container with ericaceous compost. Exhibited by H.W. Hyde. Primula × anisodoxa ‘Kevock Surprise’. A hybrid whose dark red buds open to bright red flowers. As they age they change to apricot with yellow-eye and then again to pale peach. Exhibited by Kevock Garden Plants. Raspberry Ruby Beauty (‘Nr7’). A dwarf, multi-branching and thornless form bred in New Zealand. Plants produce good yields of sweet berries. Exhibited by Scotts Miracle-Gro. Rehmannia Walberton’s Magic Dragon (‘Walremadra’). A Chinese foxglove flowering from May until the first frost. Good in sun or part shade it is also attractive to bees. Exhibited by Hardy’s Cottage Garden Plants. Restio tetraphyllus syn. Baloskion tetryphyllum ‘Cornish Gold’. Variegated form with golden yellow banding on light green culms. Evergreen and suited to containers. Exhibited by Trewidden Nursery. Rosa Susie (‘Harwhistle’). Patio rose with citronella-scented apricot pink blooms. Exhibited by Harkness Roses. Tiarella ‘Angel Wings’ (Fox Series). Small, neat form with dissected foliage and dainty pink buds opening to white frothy wands in spring and summer. Exhibited by Plantagogo. Viola ‘Frilly Dilly’. Hardy viola with erect stems bearing scented white frilled flowers flushed purple when young. Exhibited by Victorian Violas.